I bought my first .172" caliber rifle in June of 1999. It was a Remington Classic Model 700 chambered for the only factory .172" caliber available, the .17 Remington. Ever since that time, I have been a true small bore fanatic! As any true varminter does, as soon as (or even before in my case) having one project finished another one is already in the works. As this is being written, Im having a .17 Ackley Hornet built on a Martini Cadet action. But while waiting on this one I needed something else to do. Also being a fan of the T/C Encore line up I figured this would be a good platform to base my next small caliber from. The plan was for a short fat barrel that could be used in either a rifle or handgun formation. This required a barrel at least 16 inches in length. Having settled in on 16.25" as the finished length I now needed to decide on a caliber. Only knowing that it would be a .172" caliber and already having a .17 Mach IV and .17 Remington in the gun safe, as well as a .17 Ackley Hornet being built, really narrowed the choices. For some help I rang the phone of longtime barrel and stock maker Fred Smith at Bullberry Barrels Works (www.bullberry.com). Specializing in T/C Contender and Encore barrels I figured he would be the one to help me out. Being a single shot action, the possibilities were endless. After a brief talk with Fred, I settled on the .17 Ackley Bee and placed my order. While waiting on the barrel I called Midsouth Shooter Supply (www.midsouthshooterssupply.com) rounded up a set of Leupold Quick Release Rings and Base that held the Burris 3-12X32 EER scope in place. While cruising the web searching for information on the .17 Ackley Bee I came across an extra attractive package that was for sale. The package was a Ruger 77/22, complete with rings and scope that had been rebarreled with a Douglas tube reamed to .17 Ackley Bee! Not only that, but it came with all the necessary reloading dies. What a deal! Instead of having to go ahead and order all the proper dies, I simply bought the rifle along with the dies and had everything ready to go! Now only if all projects would be this simple. The .17 Ackley Bee is a necked down an improved version of the parent case, the .218 Bee. It is also one of the lesser-known .172" caliber rounds because of the parent cartridge it is formed from. Though the .218 Bee parent brass for the .17 Ackley Bee can be a little tough to come by, it does have its advantages. Famous wildcatter P.O. Ackley developed it back in the 1950's, and he considered it the ideal small case for the .172" caliber cartridge. Mr. Ackley thought there is relatively little gain in ballistic performance by using cartridge cases larger than the .17 Ackley Bee and cases of very much larger capacity often produce erratic results and poor accuracy. Unlike a similar .172" caliber wildcat, the .17 Mach IV (simply a necked down .221 Fireball), the .17 Ackley Bee takes on a whole new look after forming that does not in the least resemble the parent cartridge. The sloped shoulders that are the trademark of the Bee do not exist when forming is complete. This is where is gets those cool looking straight case walls and sharp shoulder. The 17 Ackley Bee, like the .17 Ackley Hornet, is chambered mostly in single shot rifles. Bolt actions are sometimes used but will not always handle the rimmed case well when feeding from the magazine. The Ruger 77/22 I picked up was originally chambered for the smaller rimmed .22 Hornet repeater but converted to a single shot when rebarreled. Being a rimmed cartridge made the .17 Ackley Bee extra attractive for the Encore project. Unlike rimless rounds such as the .17 Mach IV or .17 Remington, the rimmed kind can be extracted from the Encores single shot chamber by flipping the action open and pointing the muzzle skyward. Unless the loads are hot, the case will fall from the chamber effortlessly. This is beneficial when in a fast shooting situation where more than one shot may be presented at a time, granted its not an every day occurrence when chasing Maryland pasture porkers but it happens. The rimless rounds require that the shell be plucked from the chamber by hand before a fresh round can be chambered. Forming brass for this wildcat requires a few simple steps. The first step in the process is to run a lubed .218 Bee case into the first form die. This step will reduce the neck size to about .209." The next die is Form Die #2, this one squeezes the neck down to about .19." Finally the case can be run into the Full Length sizing die which will give it the final little squeeze to finish with an inside neck diameter of .172." When trying to go from the original .224 inside neck diameter to .172 in one step, the shoulder of the case will buckle and crush, this is why it is necessary to take it in steps and use all of the forming dies and be generous with the case lube. After the cases have been formed by running through the dies, it is time to fireform. Fireforming offers a few unseen benefits. The first is practice! These loads, in my experience, are often accurate enough for quality practice sessions. They also give you the chance to break in a barrel without having to use good loads for development. The fireforming loads used for the .17 Ackley Bee consisted of 12 grains of Accurate 2200 propellant and 25gr Hornady HPs. 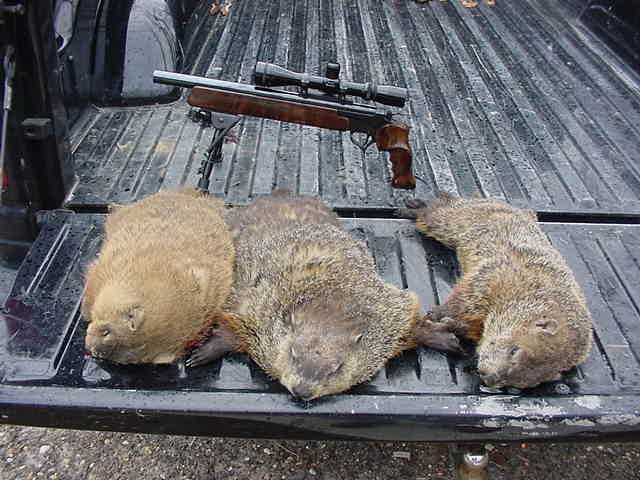 These loads were very accurate; in fact they were accurate enough to harvest a few of the first groundhogs that were shot using the Encore barrel. After a piece of brass has been subjected to this much manipulation it will "work harden" and become prone to cracking or splitting. To remove this stress I anneal each piece of brass after fireforming but before full-length sizing. Annealing brass will return it to the dead soft condition where it wont crack or split. This is done by standing the cases in a shallow pan. Then add enough cool water to cover about half the height of the standing case. Finally heat the case mouth with a small butane torch a noticeable change in case color is detected, and then tip the case over into the water. Change the water occasionally to keep it from getting too warm. To dry the cases you can either heat them lightly with a hair dryer or stand upside down in a case rack and let drain. Be sure that they are completely dry before seating primers or charging with propellant. Bullet construction is not much of a concern for the .172 caliber rounds. They dont have to penetrate thick hides, break massive bones, or drive completely through a large animal. The only requirement is for them to explodeand do it violently! The high velocity and lightweight bullets are the reason .172 calibers have become more and more popular in the past few years. As suburban areas creep steadily outward the need for cartridges that produce low noise, light recoil, and non-ricocheting bullets is becoming vital. Though not as readily available as .224 caliber bullets, .172" caliber pills can be had from a couple of suppliers: Starke, Calhoon, Hornady, and Berger. As of late, the Starke Bullet Company in Cooperstown, ND (www.starkebullets.com or 701-797-3431) has been producing some of the best bullet for use in the .172 calibers. SBC makes a full line of .172 to .308 caliber match and varmint bullets. The varmint line up is called Red Prairie Varmint Bullet (RPVB). The RPVB is a beautifully constructed bullet with a hollow point. P.O. Ackley recommended IMR 4198, or H-4198, as the propellant that produces the most uniform results. Since his time there are many new propellants in the markets that also work quite well: AA 2230, AA 2015, H322, H335, IMR 4227, IMR 4198, and BL-C2. Primers are a very important consideration when choosing components for .172" calibers. They are a major factor in getting them to shoot properly and most importantly, safely. The recommended primer for anyone handloading .172" calibers is the Remington 7 BR. Because Remington is the originator of the .172" calibers, they developed a special primer to handle the different pressure curve on the .172" compared to other small rifle rounds. Seventeens have a tendency to have a "pressure spike" unlike other calibers. Their small-bore diameter is very sensitive to changes in loads and conditions. Because of this, the harder cup of the Remington primer can handle the "spike" and not pierce. A pierced primer allows propellant gas to escape back through the action toward the shooter allowing the potential for great harm. Velocity from the shorter Encore barrel was much lower than the .17 Remington, but that is to be expected since the barrel is only 16.25" in length. After fireforming loads were all fired, resized, and prepared for loading, I began to experiment to see how fast this little bugger could go. I must say that this set of testing was relatively short. Not due to inclimate weather conditions or a busy schedule though. The springing up of groundhog cut range testing a little short and found me sitting afield with the Encore .17 Ackley Bee. The best load tested consisted of 13.0gr IMR 4198 and a 25gr Starke RPVB. The velocity only rang up to 3170 feet per second, but accuracy was top notch. Like most of the small capacity .172" caliber cartridges, the .17 Ackley Bee is noted for its mild report and low recoil. It is a good 200 to 225-yard varmint cartridge for use in settled areas. As of this writing, the Encore .17 Ackley Bee has claimed 28 Maryland bean munchers and the Ruger has gotten 19, but it also sees a LOT less field time than the Encore. Using the .17s on varmints is what got me hooked. At the crack of the shot and a solid hit, a groundhog simply quivers and goes limp. If the shot is anything less than perfect they will run a little bit and expire, occasionally making it back to their hole. The most movement from a hit is on a shot to the head, the hogs nervous system makes them flop around a bit, but as with any head shot they are still dead. In conclusion I must say that varminting with .172" calibers is unlike anything else, the .17 Ackley Bee especially so. It is a very efficient round, cases are easy to form, with good loads it provides excellent velocity, and case life is very respectable. The only down side is that brass may be difficult to find at times but once located and a decent size lot is obtained the cases will last a lifetime. With good forming procedures and careful resizing, some of my cases are up to eight reloads. If you are looking for a top notch varminting round with no recoil and low noise, and would like to try something a little off the wall then give the .17 Ackley Bee a try.